No matter how careful you are when moving furniture, hanging pictures, or going about your daily business, you'll eventually find yourself with a few holes in the walls of your home. Fortunately, it's easy to fix most holes, and the process doesn't take a lot of time. 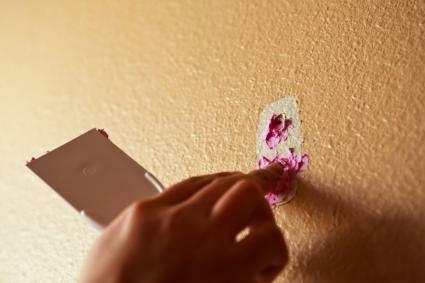 Whether you're missing a fairly large chunk of drywall or just need to patch a nail hole before you repaint, you can probably fix these issues yourself. As you move pictures from place to place or redecorate, you may notice that you have a few nail holes on the walls of your home. If you're planning to repaint or sell your home soon or you simply want to spruce things up a bit, you can easily repair these tiny holes. Start by taking an inventory of the number of nail holes you have. If there are more than a few of them in a small area, you may need to repaint a section of the wall. Put on a pair of gloves to protect your hands. Using your thumb, smooth out any raised areas of drywall around the nail hole. A little pressure should make them even with the rest of the wall's surface. 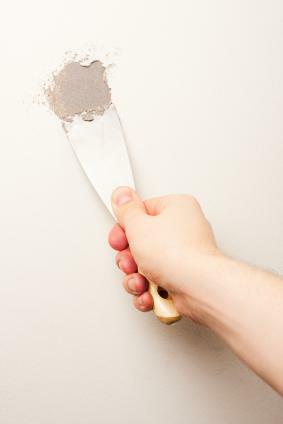 Dip your putty knife into the spackling compound to get a small amount. Press this spackling compound into the nail hole, using the putty knife. Use the putty knife to scrape off any excess spackling compound surrounding the hole. You want to leave as little as possible on the wall because it can create an unsightly bump. Dampen a paper towel with water, and wipe off any spackling compound that remains on the wall around the nail hole. Allow the spackling compound to dry according to the manufacturer's instructions. In some cases, the compound will change a different color when it is dry. 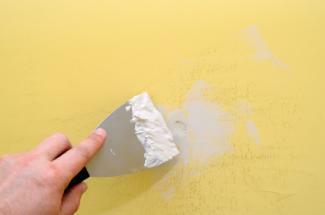 After the compound is dry, use fine sandpaper to smooth out the surface so it matches the rest of the wall. Wipe off any excess dust with a paper towel. Continue patching holes until you've finished with the wall. If you have several holes, you'll need to prime the surface of the wall before you repaint. If not, you can simply dip a rag into a little of the paint and carefully apply it to the patched area. Remember to feather the edges so it doesn't stand out from the rest of the wall. Although drywall gives a practical, smooth surface for walls, it can be fragile. Something as simple as opening a door too hard against the wall can cause a hole. Although these holes look bad, holes up to eight inches in diameter aren't that hard to fix with a little patience and few key supplies. You'll need to use this method for any holes over half an inch in diameter. Measure the hole in the drywall and record the dimensions. Add two inches to the length and width, and then cut this size of piece out of the adhesive fiberglass mesh. Hold the mesh up against the hole to make sure it covers all areas. Trim as needed to avoid excess. Wearing gloves, begin preparing the wall. 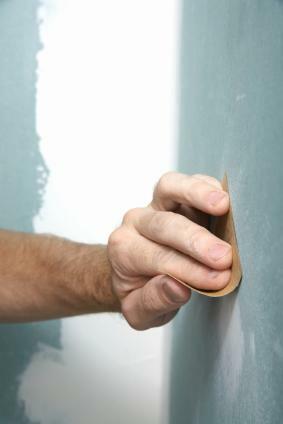 Remove any loose pieces of drywall or paper, and use sandpaper to smooth the surface as much as possible. Use a damp paper towel to get rid of any dust. Without removing the backing, place the patch against the wall and trace around it with the pencil. This will help you place the patch correctly. Make sure the wall is completely dry and dust-free. Remove the backing of the adhesive fiberglass mesh. Apply the mesh to the space you marked and carefully press down around the edges to help it adhere. Using your putty knife, scoop up some drywall patching compound. Starting near the center of the mesh, begin pressing the compound gently into the fiberglass, making sure it sticks. Continue adding compound until you have a layer covering the entire patched area. Use the putty knife to smooth out the drywall patching compound. It's essential that it is as smooth as possible. Use a damp paper towel to wipe up an excess compound on the surrounding wall. Allow the drywall patching compound to dry according to the manufacturer's instructions. It's normal for the compound to shrink as it dries. Apply another coat of drywall patching compound to bring the surface of the patched area even with the surface of the surrounding wall. It may take three or more coats to achieve the right height. Allow the compound to dry between each coat. Put on a dust mask and gently sand the surface of the patched area, concentrating on the edges that meet the wall. You need the patched area to be perfectly smooth. 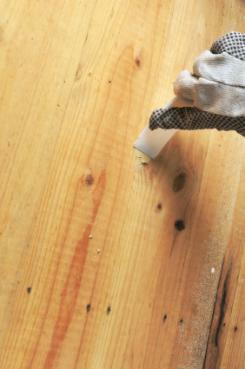 When you're done sanding, use a paper towel or tack cloth to wipe up any dust. Apply primer to the patched area and allow it to dry. Apply paint in the same color as the wall, feathering the edges to make the patch invisible. If your home was built before the 1950s, chances are your walls are made of plaster. While this material is incredibly durable, it's normal to have small holes once in a while. If you can't see the lathe, or boards, behind the plaster, you can patch this yourself. Use your putty knife to scrape out some of the plaster around the hole, giving the hole slanted sides. Use a damp paper towel to clean up any dust. Use a wet paper towel to moisten the plaster remaining inside the hole. With the putty knife, apply the plaster to the hole, pressing it in firmly. You want it to be not quite even with the surface of the wall. Wipe off any excess plaster with a paper towel. Use the putty knife to make grooves in the plaster you just applied. Grooves should be about half an inch apart. Allow the plaster to dry thoroughly. When the plaster is dry, apply joint compound with your putty knife, bringing the patched area even with the surface of the wall. Wipe off any excess and allow it to dry. Check to see if the surface is even after the compound has dried. If not, apply another layer. When the surface is even, put on your dust mask and sand the area to make it perfectly smooth. Wipe off the dust. Prime and paint the area to match the surrounding wall. If your home has wood walls, patching small holes isn't too difficult. However, larger holes will require help from a professional. As long as your hole is less than half an inch in diameter, you can use this method. Before you begin, sand off any splintered areas surrounding the hole. Use the putty knife to apply the wood filling compound to the hole, pressing it into the hole firmly. Wipe off any excess. Allow the putty to dry according to the manufacturer's instructions. Sand the wood filler to make it smooth with the rest of the wall. Apply paint or stain to disguise the spot. Your drywall hole is larger than eight inches in diameter. Your plaster hole shows wood behind it or is especially large. Your wall is made of wood, and the hole is larger than half an inch. Your wall is made of paneling or another similar material. There's no reason to be intimidated by small or medium holes in your wall. With a little time and effort, you can make your wall look as good as new again.